I recently redesigned my network configuration from a single /24 address range to multiple /24 ranges with routing done on my core switch. Part of this change meant shutdown the vSphere cluster, and the storage arrays (Synology) and reassigning new IP addresses and gateways to all of these entities. 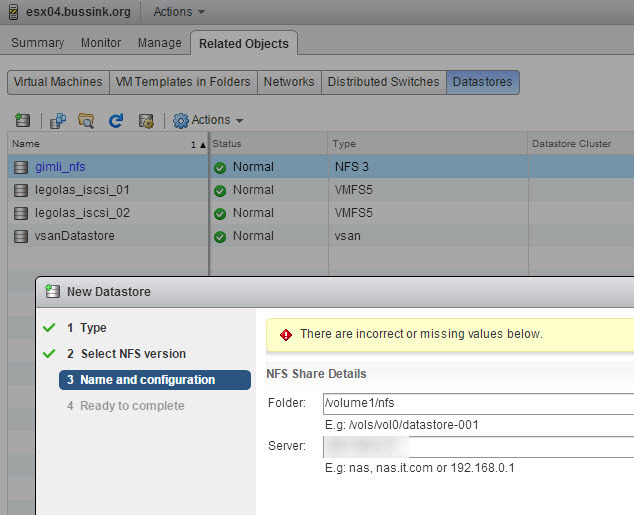 Another error message “Unable to add new NAS, volume with the label X already exists” was given on the ESXi shell when I attempted the same operations using a SSH session directly on my host. Yet the esxcfg-nas -l command did not return any values. Well it seems that the old NAS entry is still in the ESXi host, but not listed. To fix this small issue, you need to delete the non-existing NFS mount point and recreate it. In the next screenshot you see me listing my mount points, attempting to mount a new NFS volume (legolas_nfs), erasing the non-visible entry, and at last adding the new NFS volume. I hope this can save someone some precious time. HA Configuration error following VIB install. I ran into a strange problem with my InfiniBand infrastructure. For some reason, one of my ESXi host would not enter a configured HA mode. I kept getting the “Cannot upgrade vCenter agent on host. Unknow installer error”. In my post on how to installing InfiniBand and configuring it on vSphere 5.5, I make a mention of applying the esxcli software acceptance set –level==CommunitySupported command before installing the various drivers, InfiniBand protocol stack (OFED) and the OpenSM package. I must have forgotten to launch that command on a single of my ESXi host. Yet, I was able to install all the InfiniBand drivers. At the bottom of the page, I find the summary, thatthis issue occurs due to acceptance level issues with the vSphere Installation Bundle (VIB) and the host, and to change the host acceptance level to the VIB’s acceptance level. But it cannot change the acceptance level because I still have ib-opensm-3.3.16-64 installed. So the trick was to remove the OpenSM VIB, change the host acceptance level for the VIB, reboot the host, make sure VMware HA can be enabled and I reinstalled the ib-opensm-3.3.16-64 VIB afterwards. Hope this can save someone some trouble at some point. 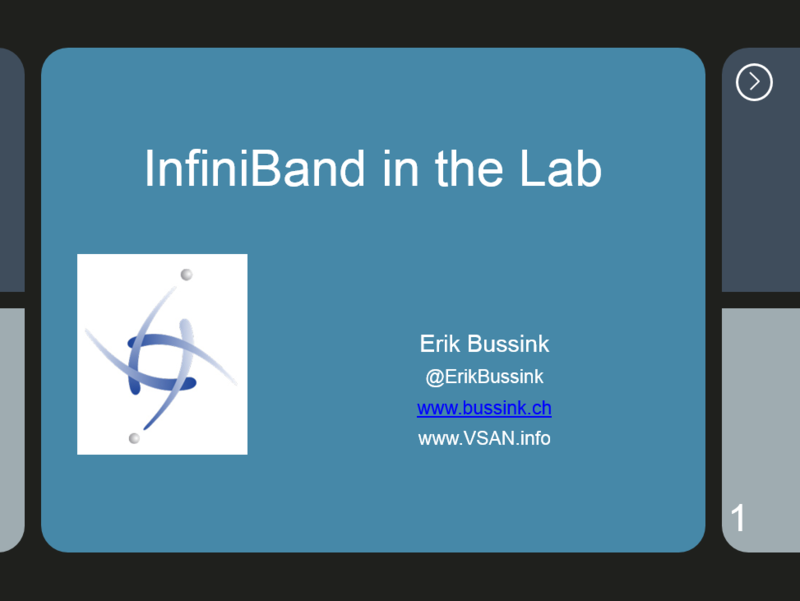 vBrownbag TechTalk “InfiniBand in the Lab” presentation. For the past few weeks I have slowly begun to build a working InfiniBand infrastructure on my vSphere cluster hosted in the office. I’m still missing some cables. With VMworld 2013 EMEA in Barcelona behind us, I’ve now got the time to publish the presentation I did in the Community zone for the vBrownbag Tech Talks. On Tuesday noon, I was the first one to start the series of Tech Talk and the infrastructure to record and process the video/audio feed had not been tuned properly. Unfortunately you will see this in the video link of the presentation. So in my video, the first 2 minutes 08 seconds, the audio is just horible… So I URGE you to jump into the video at the 3 minute mark if you value your ears. Here is the direct link to the Tech Talk about “InfiniBand in the Lab” and the link to the other Tech Talks done at VMworld 2013 EMEA. I’m not used to doing a presentation sitting in front of multiple cameras. Some of the later slides are too fuzzy on the video, so I’m now publishing the presentation in this article. InfiniBand for the Lab in iPad Keynote format. InfiniBand for the Lab in PDF format. InfiniBand for the Lab in PowerPoint 97-2003 format. The InfiniBands Host Card Adapters (HCA) for Dual 20Gbps ports (DDR Speed) can be found on ebay for $50 or $35 pounds. I hope this video link and the presentation will be useful to some of you that want to increase an intra vSphere cluster backbone for the vMotion, Fault Tolerance or VSAN traffic.